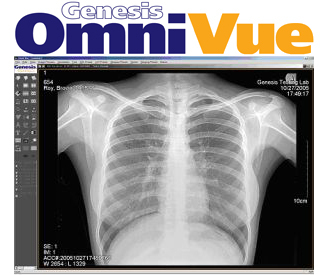 Omni-Vue is a DICOM viewing software that enables health professionals to do primary diagnostic interpretations by supporting Windows-based computer workstations and high-resolution color and grayscale monitors. Omni-Vue provides a non-linear lookup table to maximize image quality for CR & DR images and features image processing tools and HIPAA-compliant database management options. Users can directly access the Omni-Web PACS (server) as a client using direct access of ODBC and retrieve the image data within seconds. Omni-Vue is DICOM compatible with DICOM Storage, Query & Retrieve and Print functionality for easy networking with third-party PACS and other imaging modalities.